Ageing Well, an annual free event run by the City and Council of Swansea aimed at residents aged 50 plus, was held on Thursday 27th April at the Grand Theatre Studio in Swansea. Aging Well is the perfect opportunity to find out about different services in Swansea in terms of community, libraries and health care. Visitors to this year’s event found a wealth of information stands, health checks, entertainment and free refreshments. 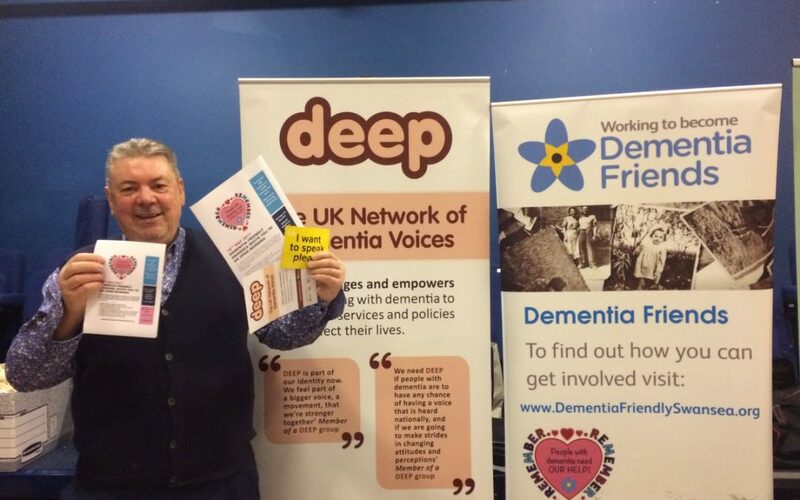 Dementia Friendly Swansea were also at this year’s event. In attendance were Dementia Friendly Chair Lesley Abbott and Admin Secretary Jude Dale. They were joined by Rachel Litherland and Nigel Hullah from DEEP (Dementia Engagement & Empowerment Project), and Susan Coleman and Nick Johnson from the ABMU LHB Dementia Care Training Team. Our aim was to provide visitors to our stand with information for people living with dementia and their carers. As well as giving out much needed information, such as Tesco’s Slow Shopping Session, we met some fantastic people and listened to their concerns. The fear of developing a form of dementia was one of the main issues that came up during the day. If you are worried for yourself or a loved one please read 5 Things You Should Know About Dementia or call the National Dementia Helpline for help and support on 0300 222 11 22. If you are worried about any symptoms you may be having, contact your GP. All issues that were brought to our attention during the event have been passed onto the City and County of Swansea Ageing Well team. Thank you to everyone who stopped by our stand and we hope to see you there again in 2018!